Production Dates: 1966 – present. Preferred Clay: own white stoneware clay and porcelain. Signature: Alexandra uses underglaze pencil to sign her work. She does not use a chop mark. Selected Major Collections and Galleries: Beaverbrook Art Gallery, Art Gallery of Victoria, Burlington Arts Centre, The David Kaye Gallery, The Secord Gallery. Alexandra McCurdy is an artist whose work crosses media in inspiration and content. 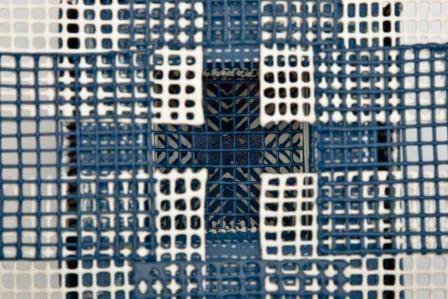 Ceramics and fibre cross and interact in new ways. Her forms and surfaces are an ongoing iconography of self-discovery and self-revelation, at first unintentional, later deliberate. There is also paradox: not only is there the expression of contemporary social values but also a frequent recall of her own history. Although her work can express symbolic complexity, her own personal message is direct and open. Born in 1944 in Wolverhampton, England, her newborn life was marked almost immediately by tragedy: the loss of her father, a Canadian RCAF pilot flying for the RAF. The loss is a recurrent theme for Alexandra, a subject that arises in her conversations and in writings about her. Her early years were spent in her maternal grandmother’s house. Textile design and technique were an early constant influence. Her mother, a designer for a textile company, and her aunts, who wove embroidery designs onto blackout curtains to conserve heat by building fabric walls to reduce the room’s size. 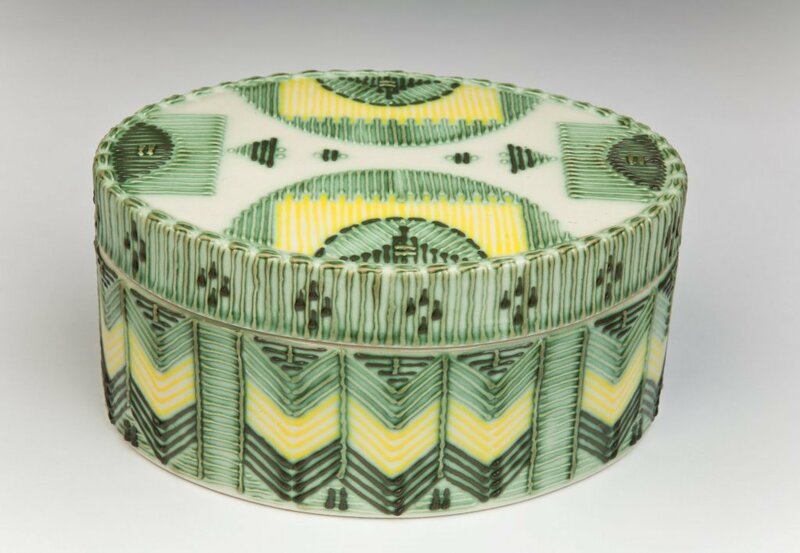 Later, wherever she could, Alexandra would study textile techniques and designs, both as complements to her ceramics, and as important media and historical elements in their own right. Ceramics came into her life by less than direct paths. 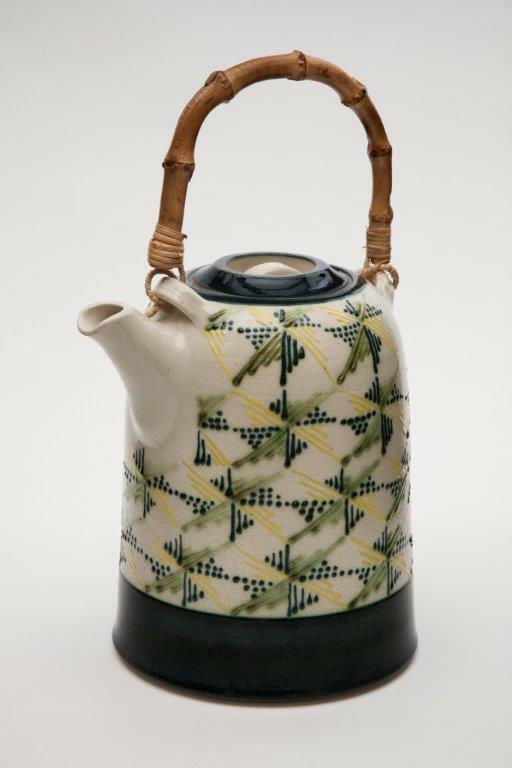 It is interesting that since her early studies were in drawing and painting, along with her lifelong interest in textiles, that she even became a ceramist. For example, early in her married life she was in Beaconsfield, Quebec, where she studied with the ceramist Rosalie Namer because textile lessons were not available. At another time, while passing by an NSCAD pottery studio, she saw students working in the studio and thought “that looks like fun.” From that time forward ceramics was the medium for her. Her time at NSCAD (1976-80) as a mature student – she was 35 years old – at first proved to be a challenge. John Reeve, as visiting artist, and Homer Lord were her salvation. 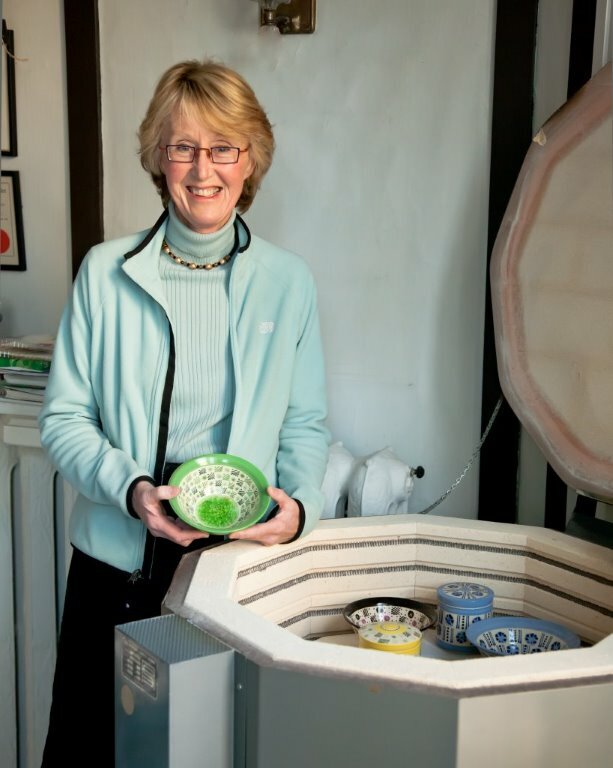 They encouraged her to experiment with white clays and multi-coloured glazes in her work. Nonetheless, it would still be several years before she found a style and approach that was more suited to her needs. Feeling artistically lonely she went to study in a winter session at the Banff Centre. While there Leopold Foulem, an instructor, recommended she get her Masters degree. Although she was accepted into the pricey Royal College of Art, another instructor, Richard Slee, suggested she attend the Cardiff Institute of Higher Education, Wales for the quality of teaching. Her MFA thesis was on Women in Craft and included research into suffragette symbolism: for example, the triangle for equality; the rhombus, a call to unite; the ladder, the metamorphosis of women over the years. The resulting convergence of fibre and clay, and of representation and symbol, have been constant, conscious directions ever since. Alexandra McCurdy has exhibited widely across Canada, and in Zagreb, Yugoslavia, Tokyo, Japan, Faenza, Italy, and Florida, USA. She is also widely collected by private collectors, museums and galleries. Alexandra’s work is of two general types, production and personal-exhibition. This page will deal with the latter. Although these images are arranged chronologically there is much revisiting and renewing of styles and forms in Alexandra’s work over the years. Also, there is a two-part video produced for her exhibition opening, “The Fabric of Clay,” at the Burlington Arts Centre, that is informative not only about Alexandra and her work but also has an engaging interplay between the artist and the exhibition-curator, Gloria Hickey, showing why the exhibition was a success. Copper Red Jewel Box, 1978. Photo: Chris Myhr. Copper Red Jewel Box, 1978. Porcelain, coloured slip, transparent glaze fired to Cone 10 in reduction. 6 x 7.5 cm. This is an early work before Alexandra found her voice in her later styles and symbols. These little “jewel boxes” were so named because they were placed in the kiln amidst large “oatmeal-coloured” glazed casseroles and bean crocks, so popular in those days with the other students. They were made at NSCAD when John Reeve was there teaching and were the beginning of decoration for her. 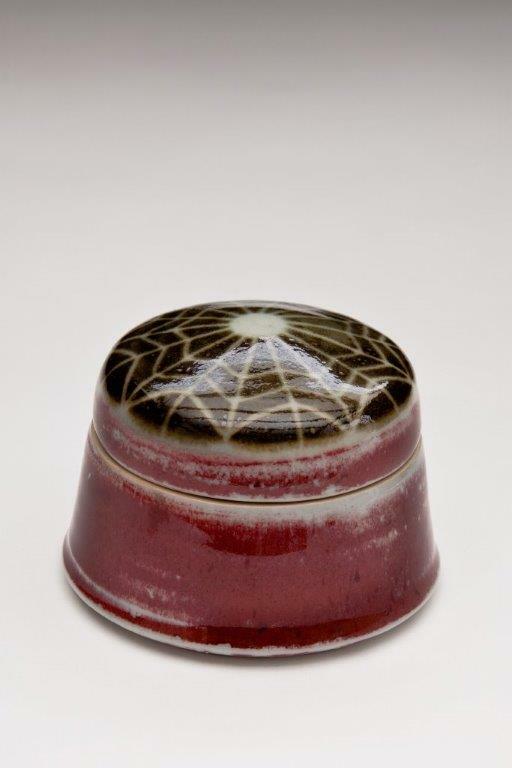 She was interested in the colour and the depth of the glaze. The spider web top prefigures her weaving motifs of later years. Like much of her work these works are small, intimate in size, personal. Alexandra continues to create multi-coloured pastel-hued pieces in her production work, as seen in the portrait at the top of this page. Her later work is more monochromatic. 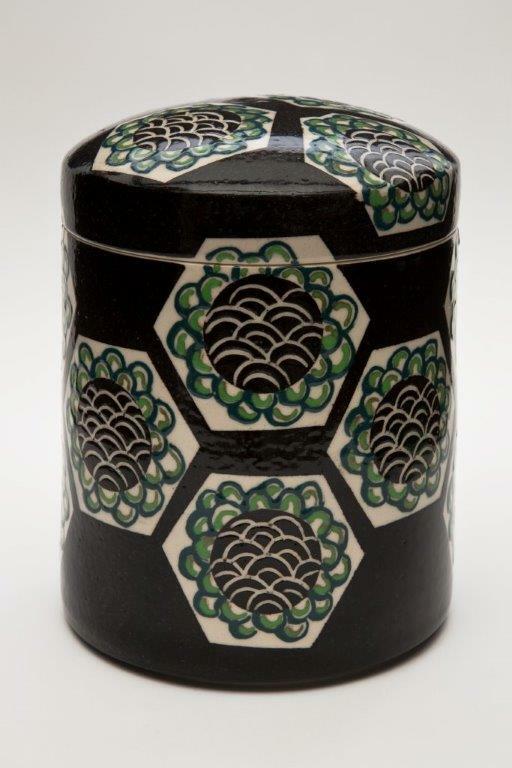 Black “Imari” Covered Jar, 1979. White stoneware, underglaze colours, transparent glaze, fired to Cone 5. 17 x 13 cm. This is an example of the work Alexandra was doing before she discovered women’s patterns as a key influence in her work. 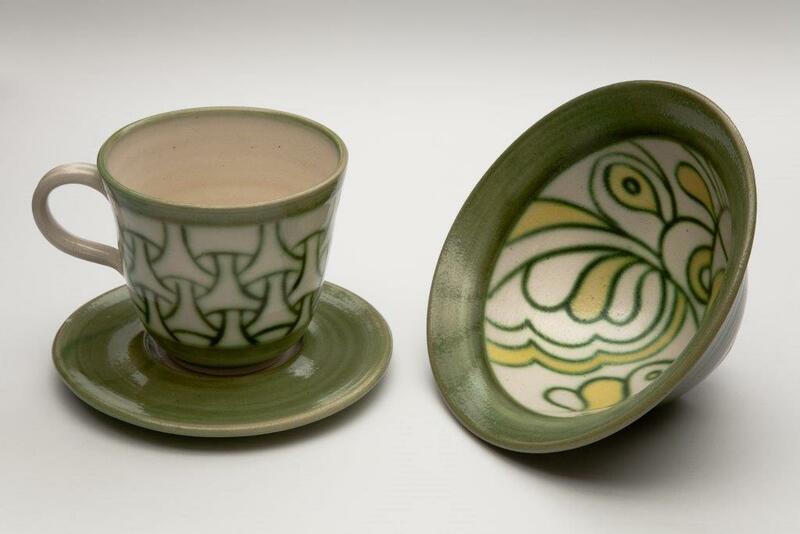 Copper Green “Mishima” Bowl and Cup and Saucer, 1981. Photo: Chris Myrh. Peacock Blue, Yellow and Green Teapot, 1982. Photo: Chris Myhr. Peacock Blue, Yellow and Green Teapot, 1982. White stoneware, underglaze colours, transparent glaze, fired to Cone 5. 14 x 22.5 cm. This is an “iconic” teapot. The work was in an exhibition that changed her direction forever. It was included in a juried exhibition at Mount Saint Vincent University Art Gallery in Halifax, N.S., called All Fired Up. A friend looking at it commented that she liked Alexandra’s use of quilt patterns. 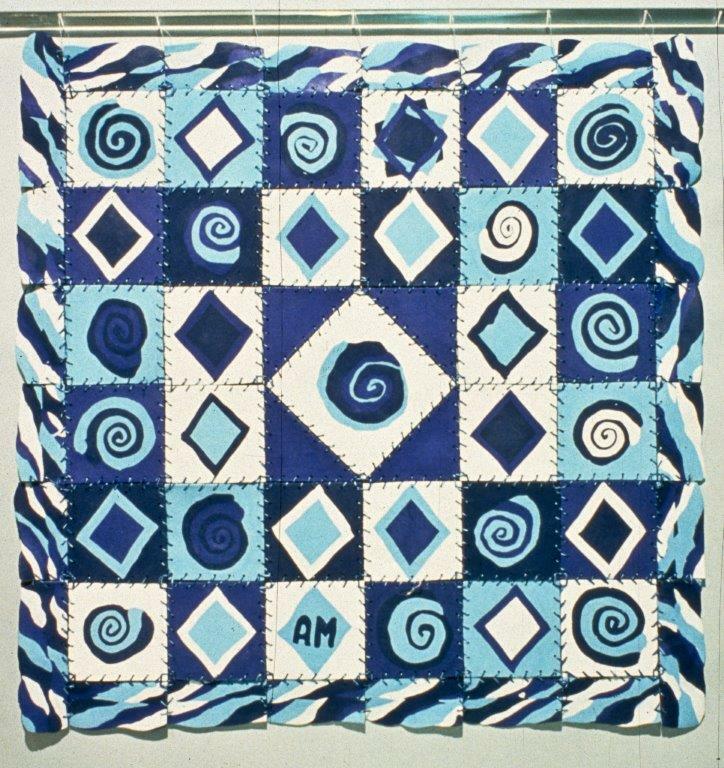 McCurdy had no idea that it was a quilt pattern, but that comment started her search for textile patterns used by women, and that were a celebration of women’s craft. The bell-shaped work also displays an early use of Mi’kmaq dyed quill-work design arranged in lozenge shapes. Green and Yellow Oval “Quillwork” Covered Box, 1987. Photo: Chris Myhr. Detail of the Blue Butterfly Box, 1991. 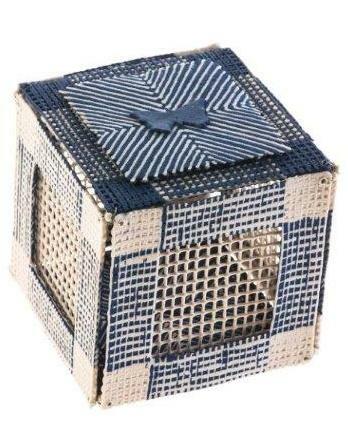 Showing the caged butterfly at the bottom of the box, as one peers through the plus sign. 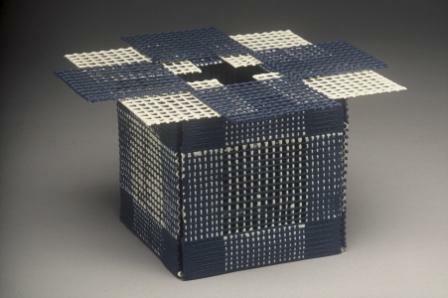 Blue Mandala, 1992. Photo:Gary Castle. Underwraps 6, 2000. Relief print on paper. 76.5 x 51 cm. This was the last of the Underwraps series of monotype underwear prints. Although not ceramics, the more overtly sexual images of the series indicate the feminist themes McCurdy has been working on. 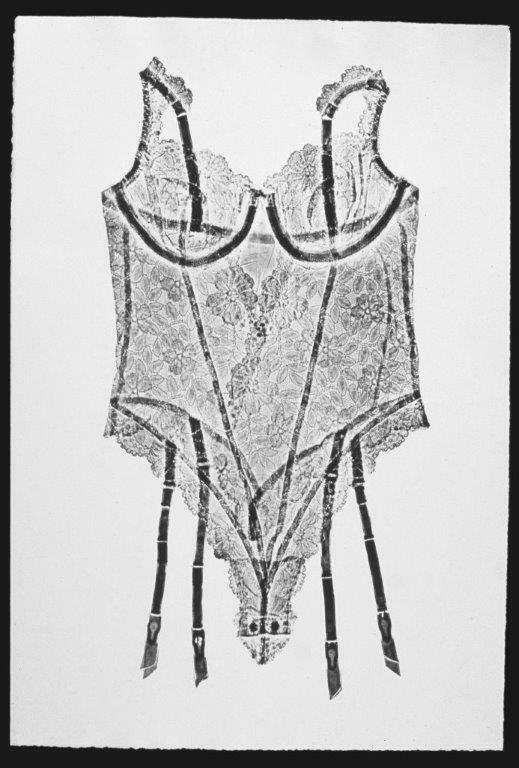 She did six prints, each representing the underwear of a particular era, beginning with her grandmother, and ending with her daughter. The actual garments were stiffened, inked and put through a 300 pound printing press. Blue Box, 2007 Photo: Chris Myhr. Blue: Chicago and Friends. 2009. Photo: Chris Myrh. Collection of Hugh Kierkegaard, Bedford, NS. 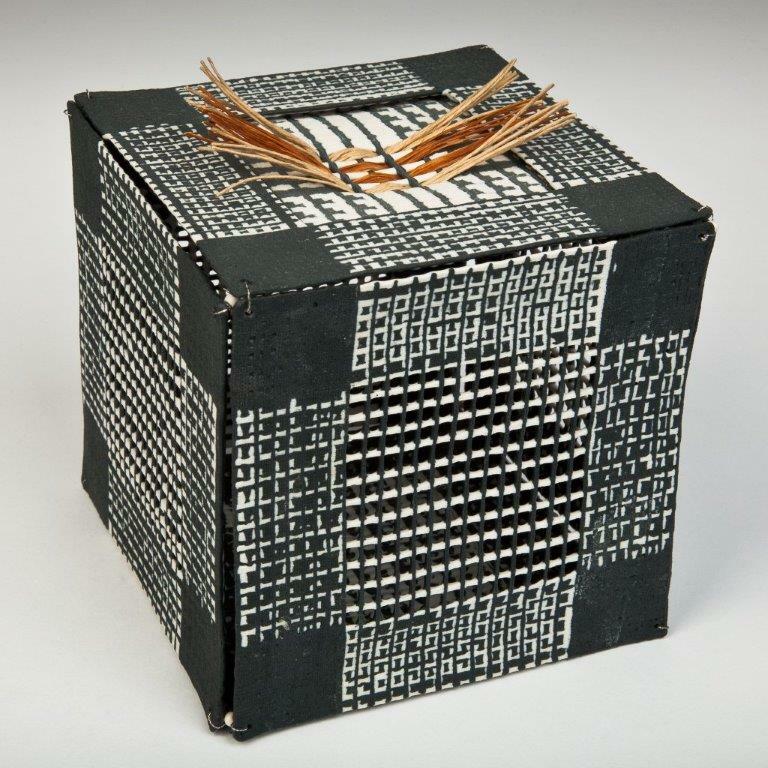 Black Box with Raffia, 2009. Photo: Chris Myhr. 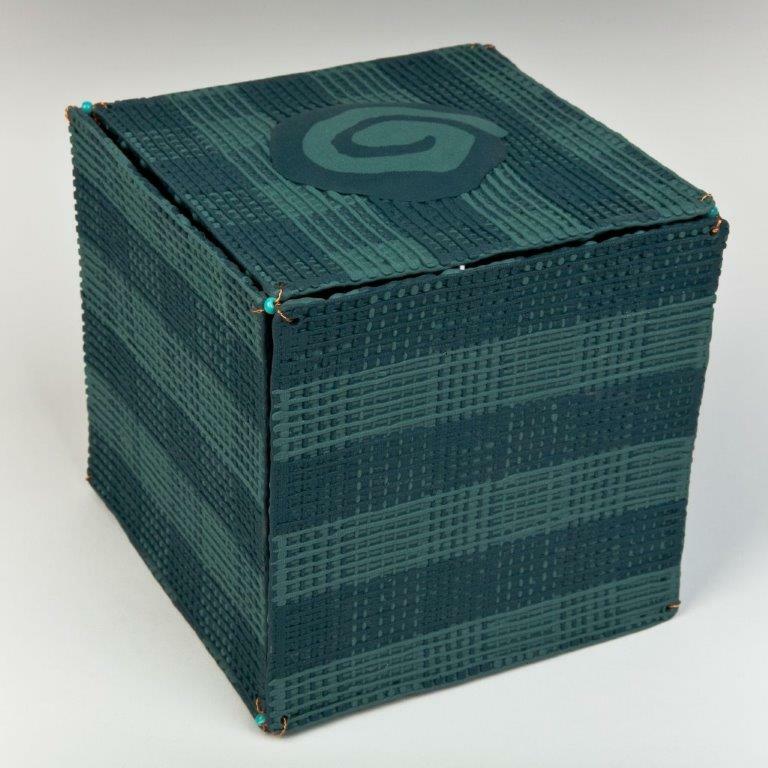 Green Spiral Box, 2009. Photo: Chris Myhr. Green Spiral Box. 2009. Porcelain, (wire, beads as connectors) fired to Cone 9 in oxidation. 14 x14 cm. 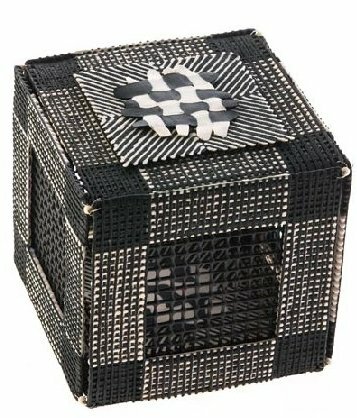 This box has no openings, but is a tweed, illustrating that yes, she can replicate weaving It is made the same way as the other boxes. The spiral symbolizes growth.2 Collection of the Beaverbrook Art Gallery, New Brunswick. The Golden Rule #1, 2010. Photo: Chris Myhr. McCurdyButterfly Box Freed (Blue Butterfly Box 2.) 2012. Photo: Chris Riordan. 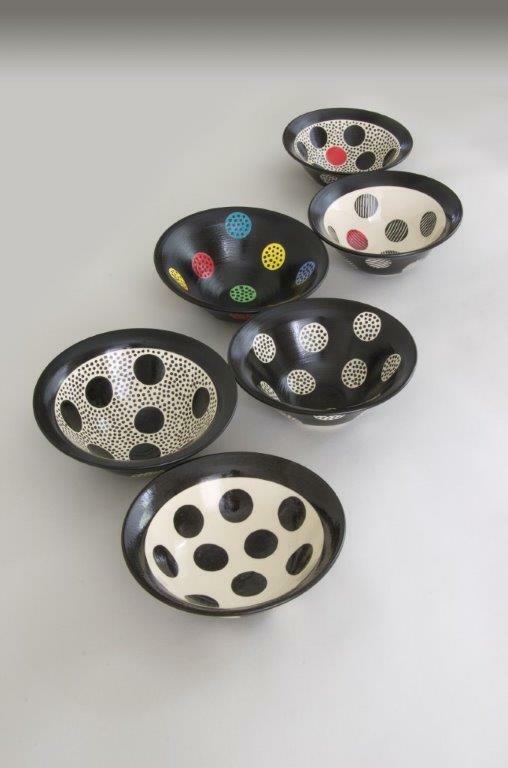 Polka Dot Bowl Series, 2013. Alexandra McCurdy uses the forms, techniques and symbolism of fibre and ceramic arts. 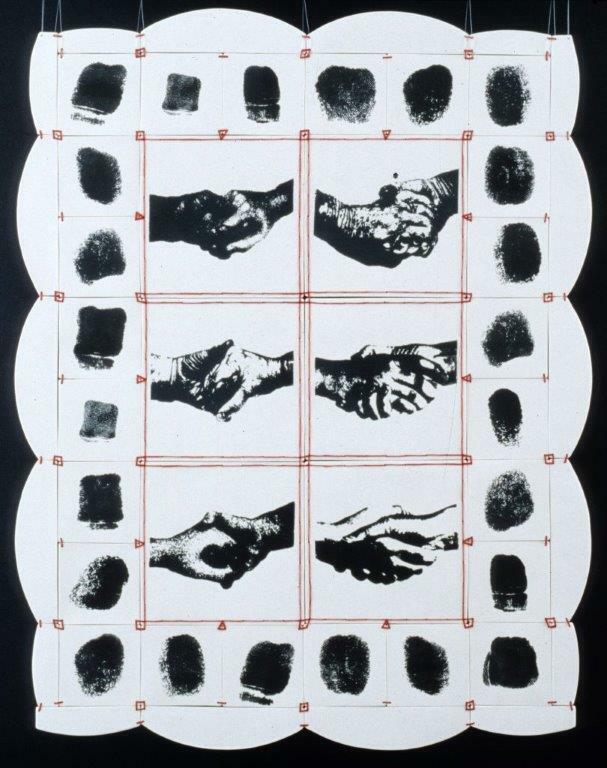 Her works are deeply personal, usually autobiographical. 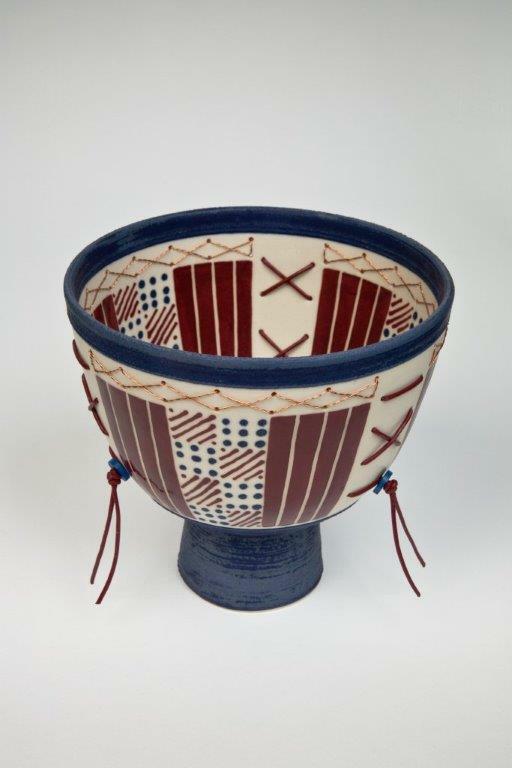 She provides an interesting contrast with the artists of the two major currents that have dominated Canadian studio ceramics: Leach and the Orient. 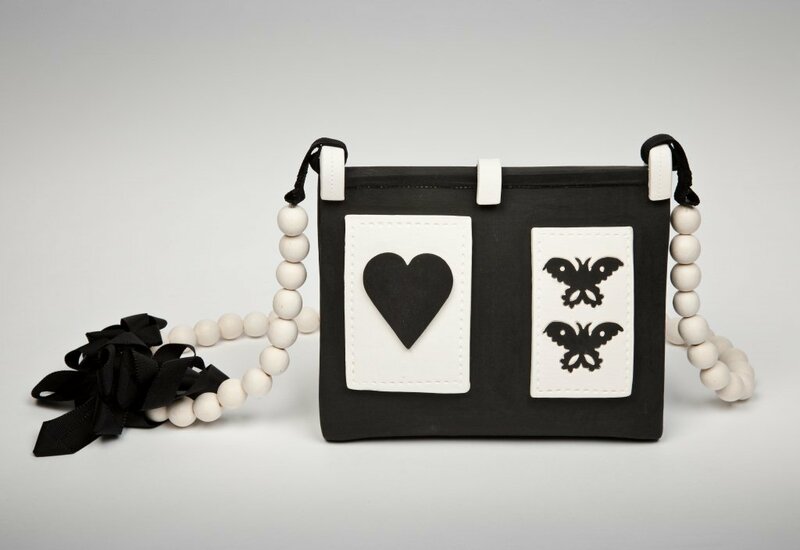 She has adopted the ethos and sometimes the symbolism of the suffragette-feminist movements, yet her style, her forms and their effects are uniquely hers. 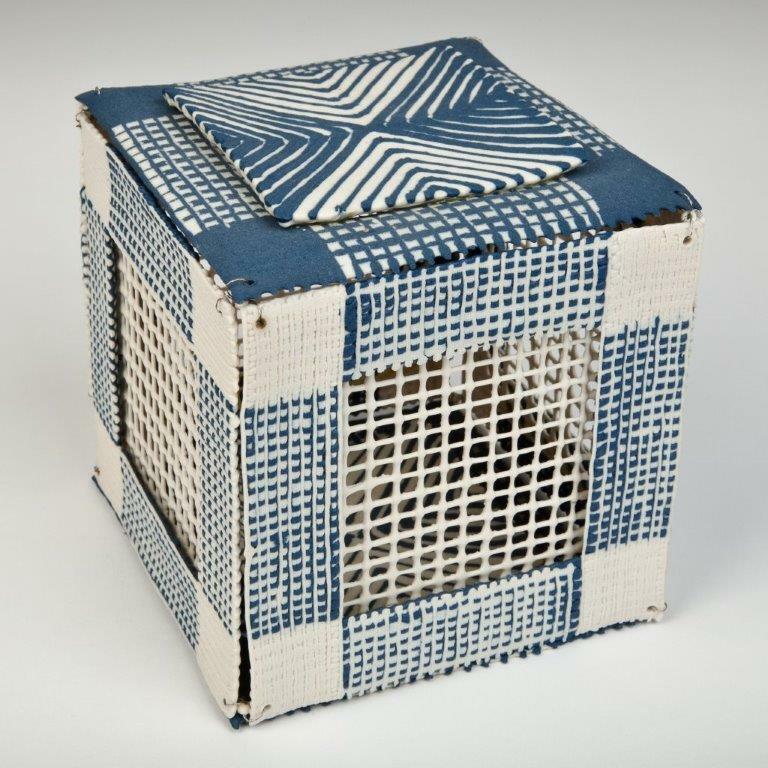 There is an excellent online article by Gil McElroy on Alexandra’s boxes you can read at The Heart of the Thing: Alexandra McCurdy’s Boxes .